Enrique Flores is one of the most prolific Mexican artists of his generation. Of course having been mentored by the late great master of contemporary Mexican art, Rodolfo Morales, hasn’t hurt; nor has the fact that two of Oaxaca’s most prominent art galleries, Indigo and Arte de Oaxaca, were his patrons for many years. But there’s no substitute for hard work, talent, and vision, each characterizing Flores. Flores has been exhibiting his work throughout Mexico and the United States since 1985. By the early 1990’s he began receiving global recognition as a significant force on the Latin American art scene, with exhibits in Japan in 1992, and Holland the following year. Heineken commissioned him to paint two murals for a US promotional campaign aimed at attracting Mexican-American consumers. His stylizing of indigenous Mexican women, as well as the distinctiveness of his work were brought to the attention of art aficionados in the 1994 publication, Arte y Alma de Oaxaca (Art and Soul of Oaxaca), supported by the Fine Art Gallery of New York; and in the 1998 landmark book, Imagenes y Colores de Oaxaca (Images and Colors of Oaxaca). He illustrated a well-received children’s book, published in both Spanish and English by The Children’s Press, Pájaros de la Cosecha (Birds of the Harvest). Flores was born in Huitzo, in the Mixteca region of Oaxaca, on July 1, 1963. He started painting during his junior high school days in the late 70’s. By 1980 his formal training had begun, studying drawing with Jesús Vásquez in Oaxaca while attending high school. 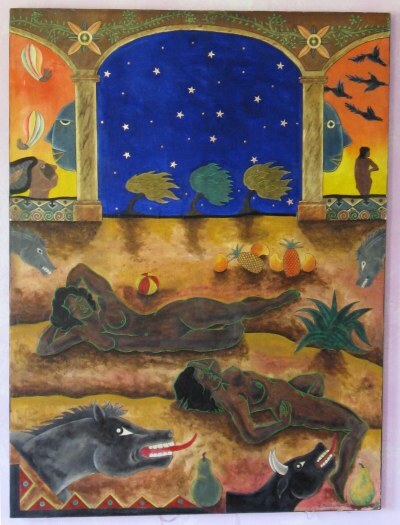 In 1981 he entered Oaxaca’s highly respected School of Fine Arts. The following year he was off to an art college in Mexico City: “But my goal had been to get into La Escuela de Pintura y Escultura,” Flores recounts. “Even though I had a recommendation from Rufino Tamayo, I wasn’t accepted because I didn’t have all my high school credits. However, all worked out for the best because a friend introduced me to Rodolfo Morales.” They developed a close relationship. Flores would regularly go to Morales’ studio in Coyoacan to chat and watch him at work, while Morales was pleased to have a young protégé upon whom he was able to impart technical advice. Upon his return to Oaxaca from the nation’s capital, Flores entered Taller Rufino Tamayo (Rufino Tamayo Workshop), where he was able to live in one of the small studio apartments while enrolled in a two year apprenticeship. He then studied under Maestro Juan Alcázar. Not wanting to commute between Huitzo and Oaxaca, he found a flat in downtown Oaxaca. In 1988, after studying under Alcázar for three years, Flores returned to Huitzo, and has remained there ever since. When Morales moved back to his hometown of Ocotlán in the late 80’s, the friendship was rekindled, with Flores meeting with Morales in Ocotlán, and periodically when Morales would be in Oaxaca. “Sure Morales was my primary mentor over the years,” Flores readily acknowledges, “but his work has provided a significant stimulus for well over half of the artists in Oaxaca. However if you examine my work carefully, it should become apparent that I’m a student of a number of the impressionists, in particular Monet and Gauguin. I consider them to be very strong influences in my work; just look at my use of color.” But ask Flores for a single name, and enigmatic Flemish painter Hieronymus (Geronimo) Bosch (c. 1450 – 1516) immediately rolls off his tongue. Enrique’s extraordinary melding of influences then becomes apparent. Despite the elements and styles which some of his works have in common with those of Morales, the impressionists, and certainly Bosch, as a student of the human condition Flores clearly derives his inspiration from a much broader array of sources--studying cultures both past and present in his homeland, and contemporary society elsewhere. For example while studying in Japan he began experimenting with oriental forms and indicia of culture such as Eastern deities. He incorporated this knowledge and his own continuous personal growth into his Oaxacan works: “I did a fair bit of pencil and watercolor sketches in my notebooks during that era. And even today I still occasionally refer back to those drawings when looking for something a bit different or while I’m struggling with how to express myself in a particular work. At times I’ve juxtaposed constituents of Japanese society with Mexican themes and traditions. Over a period of about ten years Flores spent two or three months annually in Montana, using the break from his home environment as a means of both rejuvenating and advancing his creativity. But it’s been his constant presence in the Mixteca which has been his most significant ongoing inspiration. He explains: “Huitzo was historically the frontier between the Mixtec and Zapotec cultures, so we have at least three distinct groups, the Mixtec, the Zapotec and right here in Huitzo there’s a combination of the two.” The implications? In this basket of cultures there is the richness of three worldviews, customs including dress, dance and other manifestations of culture, and perhaps more importantly for an artist such as Flores, differences in physique --- facial structure, stature, hair texture, comport, etc. In acknowledging his profound indebtedness to the likes of Morales, Alcázar and others who have generously provided their time and counsel, Flores responds in kind, giving of himself in whatever way he can to the younger generation of Oaxacan artists. There are regularly between four and six students from the School of Fine Arts working and studying with him in his workshop: “They’re welcome to come to my facility to work on their own projects, ask my advice, and simply observe how I work, and pitch in. In many cases since there’s insufficient equipment at the university relative to the number of students enrolled in the fine arts program, and since most of the students are of modest means and simply don’t own what they need, I let them use anything I have. My only rules are that on Saturday afternoon at the end of the work week, my shop is left clean and in order, and that my equipment is kept in good condition.” While Flores’ water colors and oils don’t generally require high end or expensive tools of the trade, the same does not hold true of the costly machinery and other products needed to produce lithographs and engravings. The Flores golden touch is more than a lucky lot in life as a result of having been tutored by the masters, the exposure he’s received through art books and in excess of one hundred gallery exhibitions, and for close to a quarter of a century his knack for producing what has been attracting the buying public: Enrique Flores has always had a clear vision of what he wants to achieve. At only 45, most of Flores’ career has yet to unfold. His workshop has been a long-term project, started in 1998. In true Oaxacan fashion, construction has progressed in phases. But he’s already managed to build a modern, high-ceilinged domed complex where most of his work is carried out. Although larger and better equipped than most such workshops in the state, Flores intends to proceed with further expansion, clearly a labor of love. He plans to add a building exclusively for ceramics, since while a gifted ceramicist in his own right, without a kiln and other equipment he must travel to Oaxaca to use a colleague’s facility. He also wants to expand his relatively new lithograph operation, which will require building out from the existing structure. But it will be Enrique Flores’ final two projects, already on the horizon, which will set him apart from most, and contribute to the legacy he will leave to the next generation of Oaxacan artists, and ultimately art collectors everywhere. Flores proposes to build small apartment units to house art students; and to open a gallery on the premises showcasing his own, but more importantly the works of talented and promising young artists struggling for exposure--once again giving back in the same way he received.